Start by softening vanilla ice cream then beat in the fig-lemon mixture. This late-summer favorite is sure to be a treat. Pour sugar and 1 tsp. lemon juice into a large frying pan with 3 tbsp. water. With your fingertips, mix the sugar and liquid until mixture is like wet sand. Cook over high heat until mixture boils. Continue to cook, swirling pan occasionally, until one area of the sugar starts to turn medium brown. Remove from heat and add figs and 2 tbsp. water, stirring. Return to heat and cook over low heat until mixture is bubbling and figs start to break down, about 15 minutes. Mix in butter, salt, and remaining 1 tsp. lemon juice. Let cool. Soften ice cream at room temperature for 10 minutes, then beat it in a bowl with a mixer until smooth. 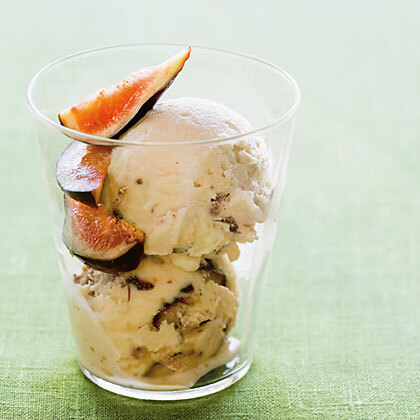 Use a rubber spatula to mix fig mixture into ice cream. Freeze, covered, until firm, at least 3 hours.